As outlandish as it may sound, the two-part “Sibling Rivalry” storyline that traversed Superior Spider-Man Team-Up #2 and Scarlet Spider #20 this month was one of the best Spider-Man stories I’ve read in 2013 (still placing it below Superior Spider-Man’s #7-9 “Troubled Mind” arc, and it remains to be seen going forward if Superior Foes of Spider-Man even qualifies as a true “Spidey” book). I thought the characterization was spot-on, the plotting was tight (maybe too tight. It definitely left me wanting more story at the end), the art was mostly good (more on that in a minute) and the callbacks to Spider-Man history were both necessary and a lot of fun. Kaine felt like he belonged in the Superior universe – as well he should have since Chris Yost writes both titles – and Spider Ock was at his most (justifiably) heinous since the status quo was introduced in January. The problem is I don’t know if my appreciation for this storyline is actually worth a damn after the dust settles and Team-Up and Scarlet Spider resume on their merry ways next month. That’s not to say the folks at Marvel responsible for putting this story together won’t be happy to hear my positive thoughts on things. But there’s just something about how “Sibling Rivalry” came and went that makes me think the entire event will be an afterthought in six month’s time. And that frustrates me as a fan who felt sincerely engaged by it. I’ve made no secret about the fact that I’ve felt jerked around by the direction of Avenging Spider-Man/Team-Up for quite some time. The series shifts its tone almost every issue and then we had that superfluous reboot last month that certainly brought in some sales (for a #1 issue) but did nothing to advance the story Yost has been trying to build since January. Spider Ock’s antagonist in Team-Up #2, the Jackal, was re-introduced in Avenging months ago as a potential long-term adversary, and then promptly forgotten about, in favor of a teased-out storyline about Otto getting his old Sinister Six buddies back together (while Otto teams with the “Avenger of the month”). And if future solicitations are to be trusted, the Sinister Six thread will march on in the near future while anything introduced in “Sibling Rivalry” will either be tabled or reserved for Scarlet Spider, a series that has 1/5 the audience the Superior universe has. It kills me that a company that gives some writers 10 issues of story to build-up to a lousy commercial for more comic books would find it suitable to give the first meet-up in years of the deranged clone of Peter Parker and the Superior Spider-Man – a man who’s pretending to be Peter Parker (and who was killed by the clone years ago) – just two comics (released on the same day) to confront each other, fight, align against a common enemy and then confront each other. I’m not advocating for crafting overlong stories with no payoff, but I think I almost would have been happier if a Kaine/Superior story was confined to a five-issue mini-series. I have to think there would be a cool story to tell in that format and it would have been infinitely better than the awful Alpha mini that came out earlier this year. 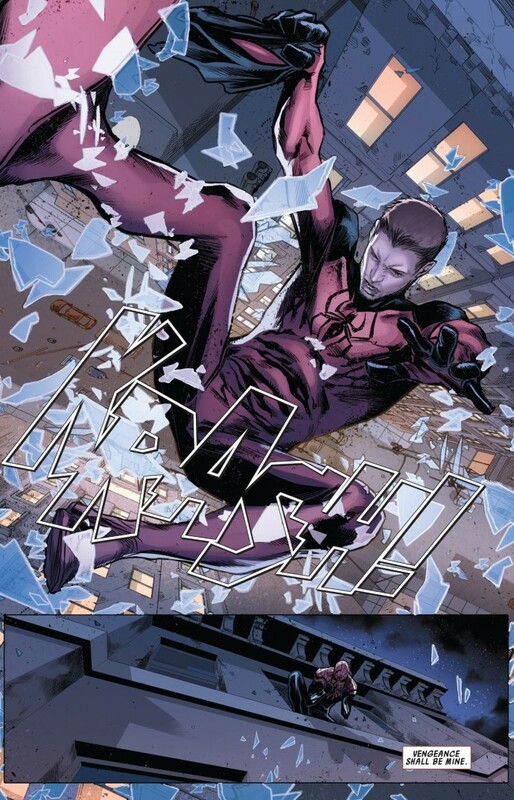 I personally loved what a maniac Spider Ock became at the first sight of Kaine in Team-Up #2. I know I don’t speak fondly of the “Clone Saga” in these parts, but I would be a liar if I denied liking the story when it was in its infancy in the mid-90s. The “Web of Death” arc, where Kaine kills Doc Ock by snapping his neck, totally shocked me as a teenager when I first read it. I’m going to write a more exhaustive post about this storyline in the very near future, but let’s just say for now that I was riding the nostalgia wave with “Sibling Rivalry” when it was first announced months ago. The moment in this story that I was anticipating the most was the moment Yost and artist Marco Checchetto immediately dove into on the opening pages of Team-Up. Since he assumed the identity of his arch-nemesis in Amazing Spider-Man #698, Otto hasn’t really run into someone who wronged him during his time as Doc Ock. 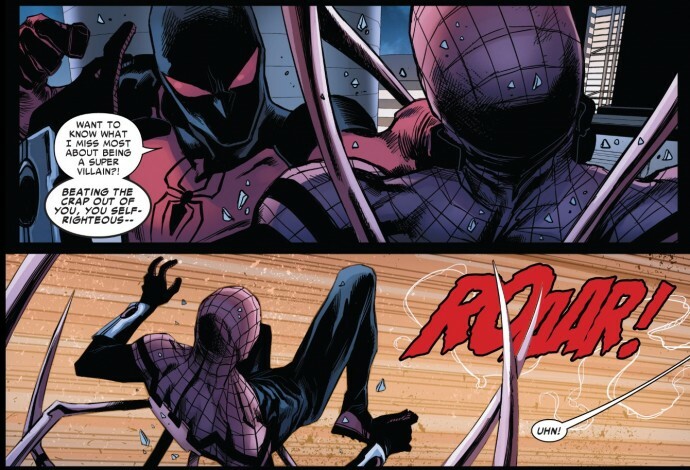 He quickly dispatched the Owl in Superior Spider-Man #10, and has managed to keep his wits about him around the Avengers despite a couple of close calls. But Kaine is the guy who KILLED him in brutal fashion (every time I say Doc Ock “died” I should mention he was later resurrected by the Hand, thus demonstrating once again nobody stays dead forever in comics except for Uncle Ben). Spider Ock’s rage is palatable in Team-Up #2. It needed to be palatable. And then Yost ratchets that visceral hatred up another notch when he has Spider Ock almost refer to himself as Doc Ock during the confrontation Kaine. Kaine gets to have his moment too. He demonstrates that he’s every bit Spider Ock’s physical equal as they’re throwing down fisticuffs in Team-Up and then gets to land a lowblow on Otto near the story’s conclusion when he owns up to the fact that he may not be a “hero,” but Spider-Man is supposed to be, and right now, he’s not acting like much of a hero either. Instead, Yost finds a situation that is much more emotionally wrenching for Kaine than having him learn that Spider-Man is secretly a supervillain. 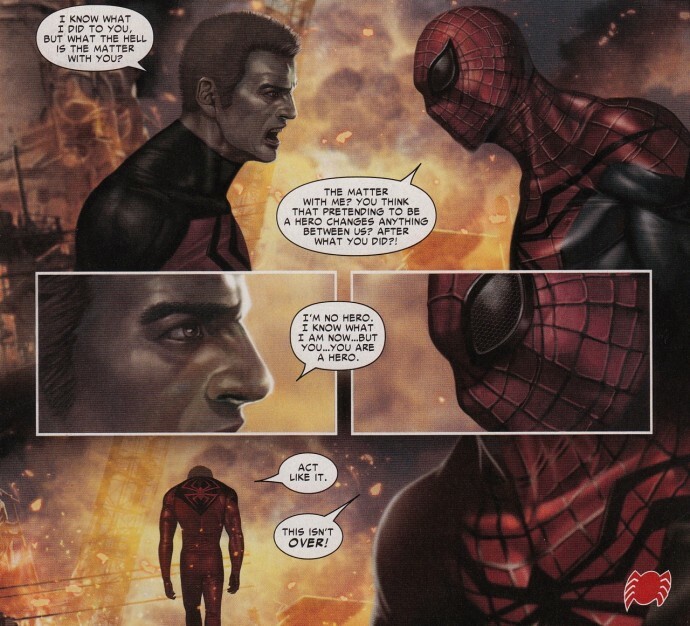 Kaine accuses of Spidey of not being a pro, and Otto’s only response is to call him a monster – to reject him the way he was rejected by his original maker, Jackal, and by society as whole. 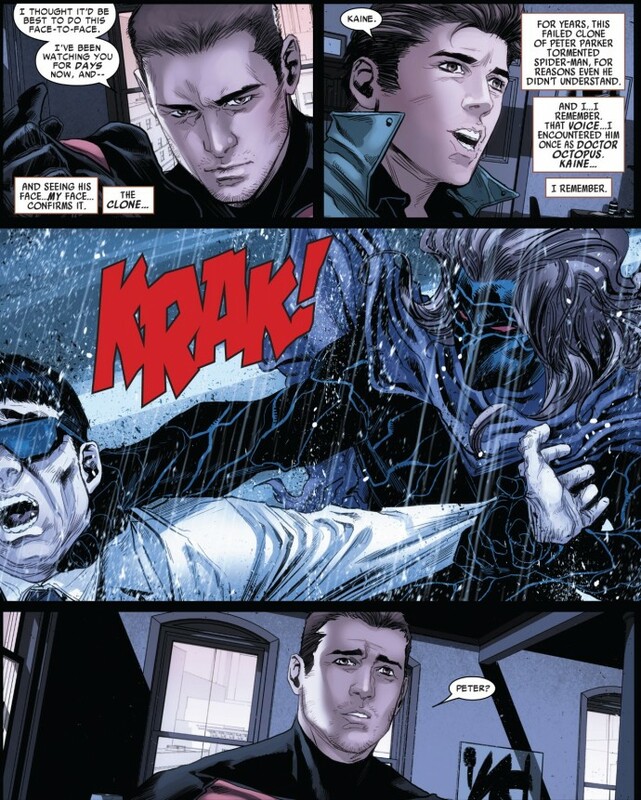 I know these two are supposed to be clones, but Spider Ock’s dismissal of Kaine was akin to a father rejecting his child. 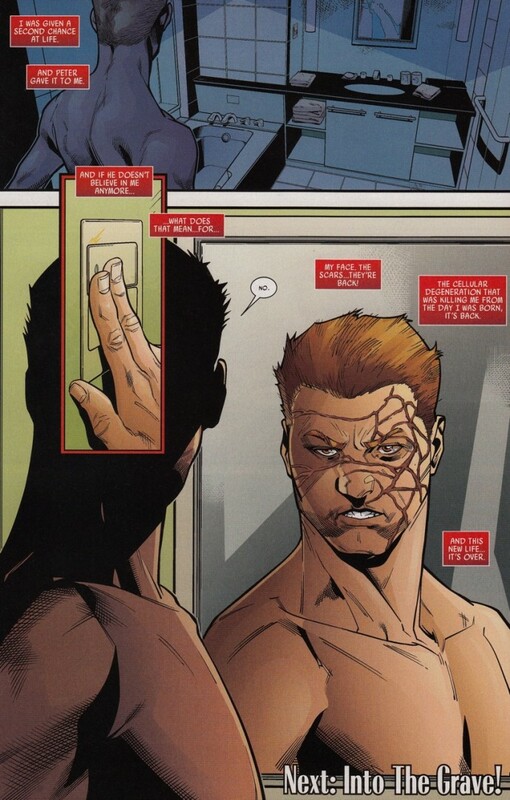 After being wounded so deeply, it’s only fitting that Kaine’s old scars would resurface at the end of the story. I enjoyed Yost’s interpretation of Jackal immensely – more of a mad lunatic a la the Joker. We got, YET ANOTHER “Bond villain” joke in this storyline, when Jackal ties up Spider Ock and Kaine and announces his evil plans AFTER he already put them into the place. And of course there’s a teaser that Jackal might be back to haunt the Spidey universe in the future, but more likely Kaine than Spider Ock (and that’s only if Scarlet Spider can survive cancellation by the time Yost gets back to this plot point). One of my biggest gripes in terms of my reading experience was the sudden shift in art styles between Team-Up and Scarlet Spider. 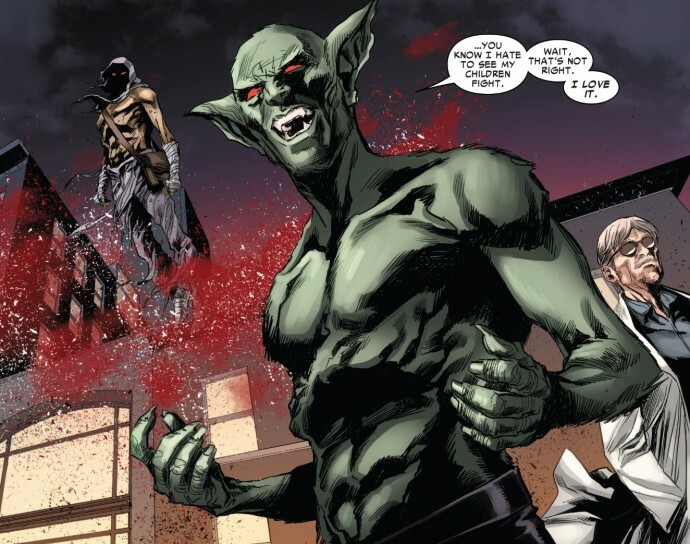 Checchetto’s pencils in Team-Up are very traditional for the comic book medium and then in Scarlet, things switch to a more “realistic” style of In-Hyuk Le. It’s not that I had a problem with Lee’s art, but the styles felt in conflict with each other. Considering both comics were part of the same storyline, I would have preferred more consistency. But more than some quibbles about the artwork, I just don’t know if I get the sense from anybody that has a say in things at Marvel that this two-part story I just read actually has any significance over the long-term for the Superior status quo. I think Yost has a lot of talent as a writer but I want to see his Superior work start to take a more consistent tone and for these issues to flow better into each other. Maybe this Sinister Six storyline they’ve been hinting at since January will be a lot of fun and my faith in the title (and the reboot) will be cemented, but it’s just frustrating for me that Yost has put together a borderline great story in these two comics and it seems like the entire Kaine/Spider Ock confrontation is a one-and-done deviation from larger, less interesting plotlines taking place in both titles.